Key difference: Rabbits are closely related to the hares. Rabbits and hares belong to the Leporidae family of the Lagomorpha order. The main difference between hares and rabbits is that hares are taller, skinner with longer hind legs and ears. Hares are larger and faster than rabbits. They have larger feet and are able to jump higher and run faster than rabbits. Hares also tend to have blackish marks on their fur. Furthermore, rabbits are altricial, which means that they are born blind and hairless. Hares, on the other hand, are precocial, which means that they are born with fur and are able to see. Rabbits are closely related to the hares. Rabbits and hares belong to the Leporidae family of the Lagomorpha order. There are eight different genera in the family classified as rabbits. While, hares are classified in the Lepus genus. In all, there are over 60 species of rabbits and hares. Scientifically, the male is called a buck, the female is a doe. The rabbit babies are known as a kit or kitten, while a hare baby is known as a leveret. Originally rabbits and hares were classified together with rodents and were later separated due to predominant opinion that many of their similarities were a result of convergent evolution. However, recent DNA analysis of the species shows that they share a common ancestry. As they are so closely related it is difficult to make straight forward distinctions between rabbits and hares. There has even been difficulty in classifying them. In fact jack rabbits are actually hares, while the Belgium hare is in fact a rabbit. Hence, it is understandable if many average folk have trouble telling hares and rabbits apart. The main difference between hares and rabbits is that hares are taller, skinner with longer hind legs and ears. Hares are larger and faster than rabbits. They have larger feet and are able to jump higher and run faster than rabbits. Hares also tend to have blackish marks on their fur. 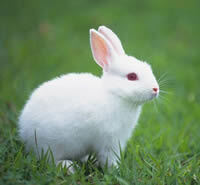 Furthermore, rabbits are altricial, which means that they are born blind and hairless. Hares, on the other hand, are precocial, which means that they are born with fur and are able to see. They are also able to hop within five minutes of being born. Hence, they can leave their family almost immediately. Hares tend to live alone or in pairs. They are usually not found in groups, as opposed to rabbits who are famously known for living in large groups under a dominant male. Another difference between them is that rabbit have been domesticated. They still exist in the wild, but hares are all wild. No species of hares have been domesticated. Rabbits are now raised for number of reasons including meat, fur, and as pets. However, both hares and rabbits are famous in numerous myths. They are in fact a preserved space in various mythologies as tricksters, and as symbols of fertility due to their high reproductive rates. Eight different genera leading to many species of rabbit. Jackrabbits - The male is called a buck and the female is a doe; a young hare is leveret. Rabbit habitats include meadows, woods, forests, grasslands, deserts and wetlands. Vary extensively from grassy hills or plains to Artic tundra. North America, southwestern Europe, Southeast Asia, Sumatra, some islands of Japan, and in parts of Africa and South America. Have been introduced in Australia and New Zealand. Eurasia, North America, southwestern Europe, South Asia and Southeast Asia. Have been introduced in Australia, New Zealand and South America. Rabbits are herbivores that feed by grazing on grass, forbs, and leafy weeds. They prefer soft stems, grass or vegetables. Their diet contains large amounts of cellulose, which is hard to digest. Rabbits solve this problem by passing two distinct types of feces: hard droppings and soft black viscous pellets. The soft black viscous pellets are eaten again to absorb the nutrients. Hares are herbivores that feed by grazing on grass, forbs, and leafy weeds. Hares tend to eat more hard food than rabbits, including bark and rind, buds, small twigs and shoot. Similar to rabbits, they re-ingest the soft black viscous pellets and discard the hard droppings. The rabbit is an obligate nasal breather. Rabbits have two sets of incisor teeth, one behind the other. Rabbits are incapable of vomiting. Hares are very fast-moving animals. The five species of jackrabbit found in central and western North America are able to run at 64 km/h (40 mph), and can leap up to ten feet at a time. Hares have jointed, or kinetic, skulls, unique among mammals. The fur is most commonly long and soft, with colors such as shades of brown, gray, and buff. The tail is a little plume of brownish fur with sometimes white on top. The fur coat is shed twice a year in spring and in the fall. Similar to rabbits but hares have black markings on their fur. Short tails. The fur coat is shed twice a year in spring and in the fall. Hares, especially those living in cold, snowy regions, turn white in the winter. 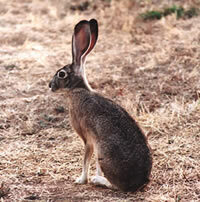 The rabbit’s long ears, which can be more than 10 cm (4 in) long, are probably an adaptation for detecting predators. Longer ears than rabbits. Some might have black markings at the ear tips. They have large, powerful hind legs. The two front paws have 5 toes, the extra called the dewclaw. The hind feet have 4 toes. Longer and more powerful hind legs then rabbits. The two front paws have 5 toes, the extra called the dewclaw. The hind feet have 4 toes. Are generally larger than rabbits. 50–76 cm in head-body length, and weigh from 2.5 to 5 kilograms. Rabbits are most active at dawn and dusk. The average sleep time of a captive rabbit is said to be 8.4 hours. A group of rabbits is known as a ‘colony’ or a ‘nest’. Domesticated group is called a ‘herd’. A ‘drove’ is the collective noun for a group of hares. However, they usually live solitarily or in pairs, not in groups. Rabbits live in groups. Courtship behavior involves licking, sniffing, and following the doe. Spraying urine is also a common sexual behavior. Normally a shy animal, the European brown hare changes its behavior in spring, when hares can be seen in broad daylight chasing one another around meadows; this appears to be competition between males to attain dominance and hence more access to breeding females. During this spring frenzy, hares can be seen “boxing” where one hare strikes another with its paws. Usually a female striking a male and refusing copulation. After mating, the female makes a nest or burrow, and lines the nest with fur from her dewlap, flanks and belly. Hares bear their young in a shallow depression or flattened nest of grass called a form. Rabbits have a very rapid reproductive rate. The breeding season for most rabbits lasts 9 months. Normal gestation is about 30 days. The female rabbit also may or may not lose clumps of hair during the gestation period. In one season a single female rabbit can produce as many as 800 children, grandchildren, and great-grandchildren. Hares also have a very rapid reproductive rate. However, less so than the rabbits. Rabbits give birth to an average of five litters each year, with four to nine young in each litter. Kits are born blind, naked, and helpless. Hares have only two or three litters, with four to six young in a litter. Young hares are adapted to the lack of physical protection, relative to that afforded by a burrow, by being born fully furred and with eyes open. They are hence able to fend for themselves soon after birth and are often abandoned by the mothers. If confronted by a potential threat, a rabbit may freeze and observe then warn others in the warren with powerful thumps on the ground. They survive predation by burrowing, hopping away in a zig-zag motion, and, if captured, delivering powerful kicks with their hind legs. Their strong teeth allow them to eat and to bite in order to escape a struggle. A hare will leap long distances across an open field in an attempt to outrun its enemy. Domesticated and raised for meat, fur and as pets. A rabbit's foot is sold as good luck charms. Hares have not been domesticated and are usually hunted for meat and/or fur. Rabbits are often used as a symbol of fertility or rebirth, and have long been associated with spring, innocence and Easter as the Easter Bunny. They are part of various mythologies. They are also valued for experimental purposes in scientific laboratories. Hares are used as a symbol of fertility. They are part of various mythologies, especially as tricksters.